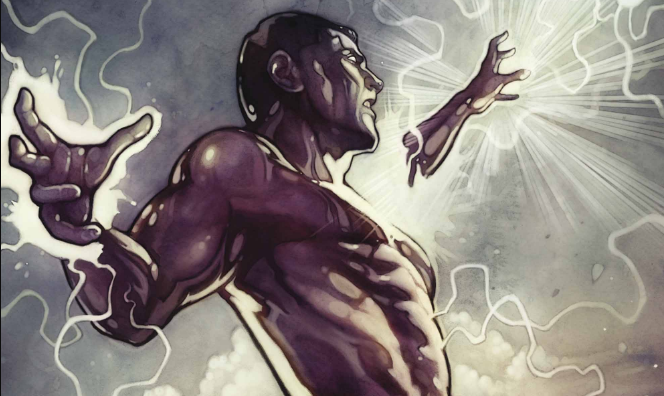 The Fall and Rise of Captain Atom #6 Review – AiPT! After besting Ultramax in a poorly defined beam struggle last issue, it’s time for a rematch between Captain Atom and this azure assassin. Can the sanguine superhero save his estranged offspring from this cobalt killer? It’s Red Vs. Blue (technically) in this final issue of the series. 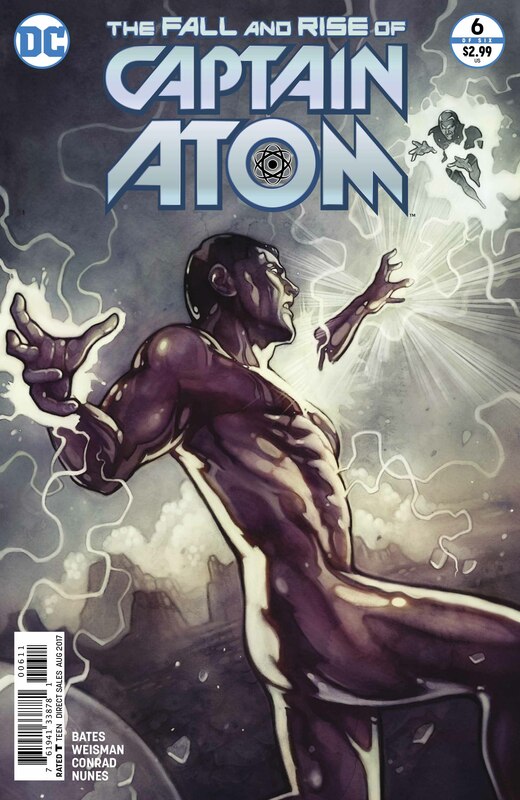 Issue #6 of The Fall and Rise of Captain Atom wraps up this reintroduction to everyone’s fifth favorite Nathan (shoutouts to Nathans Summers, Explosion, Fillion and Famous Ht Dogs) with a reasonably satisfying ending that both pays off the secret son storyline and features the climactic battle between Ultramax and the good captain. Naturally, things move at a pretty steady clip, but not so fast that you lose the moments. Adam visiting the grave of his late wife adds a little bit of emotional poignancy for an issue that is pretty light on that, and the last few panels leave enough mystery to provide the character with enough mystery to give him a place in other books. Yes, without spoiling too much, that does mean this book has a happy ending. From a writing standpoint, this issue is what you might call good, not great. Eiling’s dialogue, for example, is suitably manipulative and charming in both his handling of Nathan’s distrust and his ploy to get past Ultramax. On the other hand, there is the transparent and silly tricks that allow Eiling and the Captain to best Thrane. It essentially boils down to a “look over there” followed by an “I am rubber and you are glue” tactic that really shouldn’t work, but does. It’s a very expositional six page sequence that is fine, just a little flat. The final few pages hint at bigger and better things for our hero, as well as his son, Genji, leaving this series feeling a touch like the prelude to more interesting fare. The artwork on this book has been remarkably consistent throughout the series. Will Conrad’s pencils remain their familiar form of strong, barring perhaps the face on Superman in the last panel of the issue, and Nunes’ coloring continues to be on point. I particularly enjoy the little tricks with color used to provide a subtle glow to Captain Atom’s eyes in his scenes with Eiling, it makes a rather mundane sequence pop just a little bit. Overall, this is an okay end to a good book. Bates and company built a pretty interesting series around a character that has always been a bit bland. I guess there’s little helping the fact that even his best stories tend toward the more mundane. Still, I’d be interested to see this creative team working on a–let’s call it, more captivating character in the future. Bates and company built a pretty interesting series around a character that has always been a bit bland. I guess there’s little helping the fact that even his best stories tend toward the more mundane. Conrad and Nunes’ artwork has been a strong point throughout the whole series. It’s a decent enough wrap up for this story. You’re left feeling like there’s something missing from the story, so it’s a touch unsatisfying. Things wrap up very quickly...too quickly. It’s deflating.